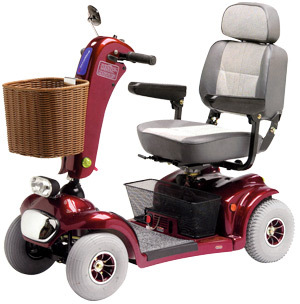 The Invamed Briza 4 Deluxe scooter is a four-wheeled unit suitable for use indoors or out. The scooter is easily dismantled with out tools for transportation. Direct drive sealed transmission/gearbox for efficiency combined with electro magnetic brakes for maximum safety. The control panel allows the scooter to be easily set to suit the users requirements. Speed settings are from 1-10 on the speed knob 6kmph (4m mph) being the maximum. Red coloured bar level indicators show battery charges levels. On board battery charger. An automatic braking system will operate when the thumb levers are realeased. A free wheeling device allows the scooter to be pushed if needed. Captain seat supplied as standard.